We’re suckers for board games that look old and interesting in some way. Don’t get me wrong, we also love finding the gems from our 80s childhood that everyone remembers, but sometimes it’s nice to just try something completely random. That’s exactly what we did with Seven League Boots. 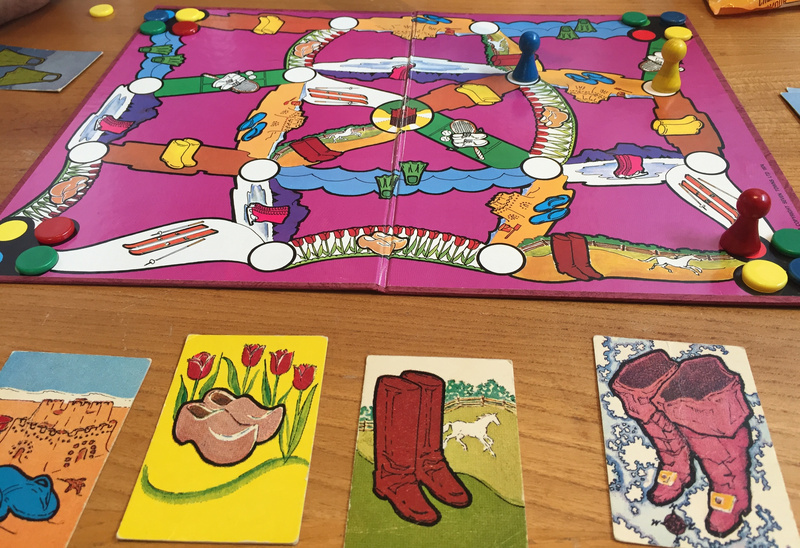 Picked up from a car boot sale, the aim of Seven League Boots is to travel all around the board, visiting each corner and collecting an appropriately coloured counter at each as proof. To make each step of your journey, you need to have either the appropriate footwear, or a pair of magic boots. That’s where the Seven League Boots come in. Each player chooses a playing piece colour and places their piece at the centre of the board on the “home square”. They also place a counter of their colour in each of the four corners of the board. The pile of playing cards (27 in total) are shuffled and four cards are dealt to each player. These are your footwear, which allow you to travel around the board. The remaining cards are placed face down in a pile on the table, next to the board. Each leg of a journey has a picture of a piece of footwear on it. To be allowed to travel along a path you have to have the appropriate footwear. For your turn you can either play a card and move your playing piece one step around the board, or, if you don’t have appropriate footwear, you can use your turn to swap. When you play a card, or swap one, you place it face up on a discard pile, and then take a new card from the face down pile. The twist in the game is if you have a card with the Seven League Boots on it. These cards mean that you can go along a path that has any footwear on it. The winner of the game is the first person to return home after collecting all four of their coloured counters from the four corners of the board. What are Seven League Boots? Seven League Boots come from European folklore and were boots that allow the wearer to take strides of seven leagues per step, where a league is a unit of length. Boots are often presented to the main character in a story by someone magical to help them complete something significant in the story. 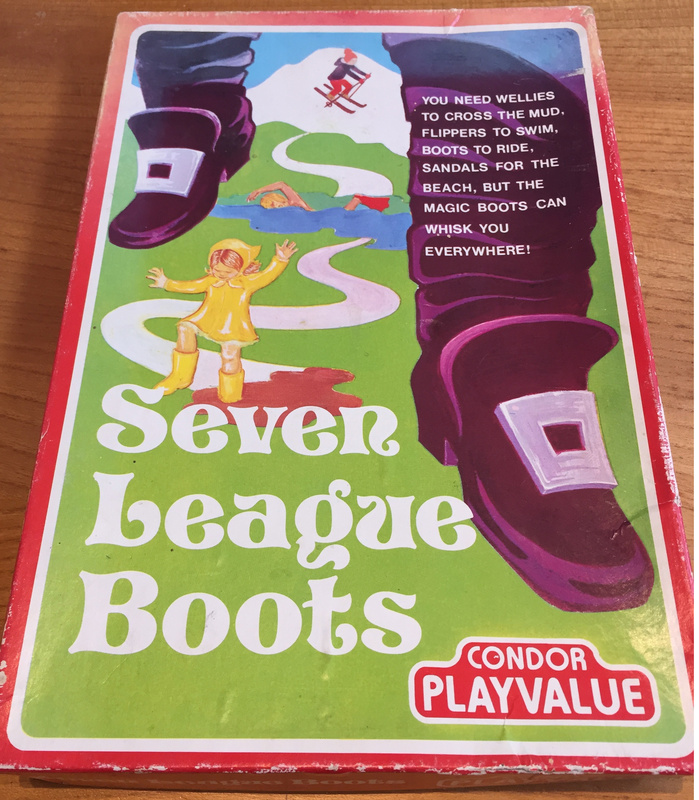 In this game’s case the Seven League Boots allow the player who has the card the “magical powers” to travel along any path in the game. We played Seven League Boots with Master C when he was off school sick one day. 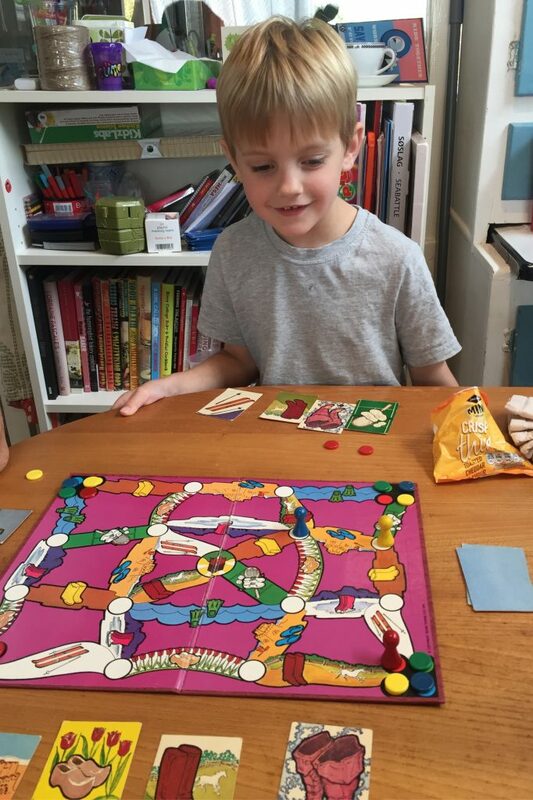 I’ve been on the look out for games to replace Snakes and Ladders and Ludo for someone like him who can’t yet read properly, but loves playing board games. Once we’d explained the rules to him and how he needed the appropriate footwear to travel along each path he was well away. He thoroughly enjoyed the game, especially because he won. It was nice and simple enough for him to follow what going on and also for him to strategically plan ahead and retain cards that he could see would aid him in getting to where he wanted to go. For the adults playing, the game had enough complexity to keep us entertained, whilst also being simple enough that my son didn’t need help. The design of the board and the playing cards have a very 70s feel about them, giving the game a retro charm befitting of its age. I can definitely see it as a game that we will come back until Master C graduates on to the next level of board games. Believed to have been first published by Condor under their Condor Playvalue name in 1974, the game is copyright Seven Towns Ltd.
I’m a bit of a sucker when it comes to branded toys and games that I remember from my childhood. The Tetley Tea Folk were all over the place when I was a child. Numerous TV adverts and also pieces of tea related memorabilia. 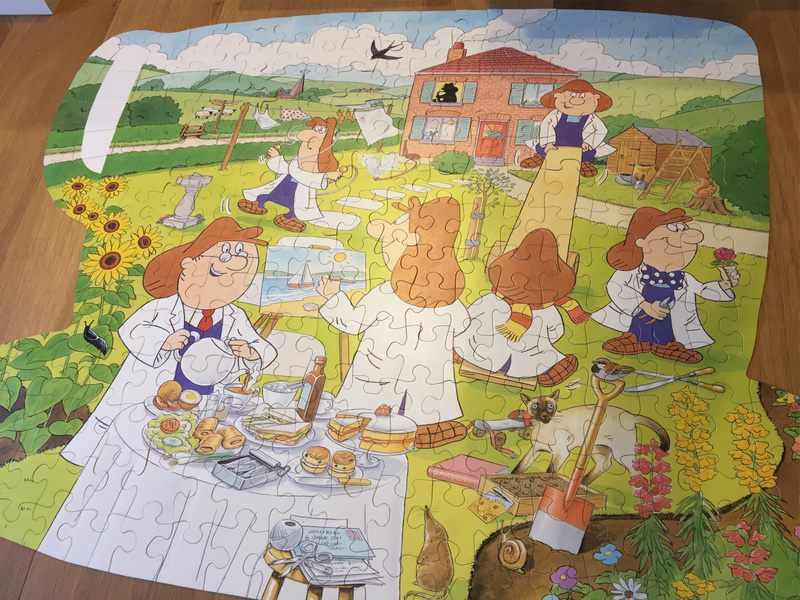 I was therefore thrilled to find a double sided jigsaw featuring them when B and I were at a car boot sale earlier in the year. 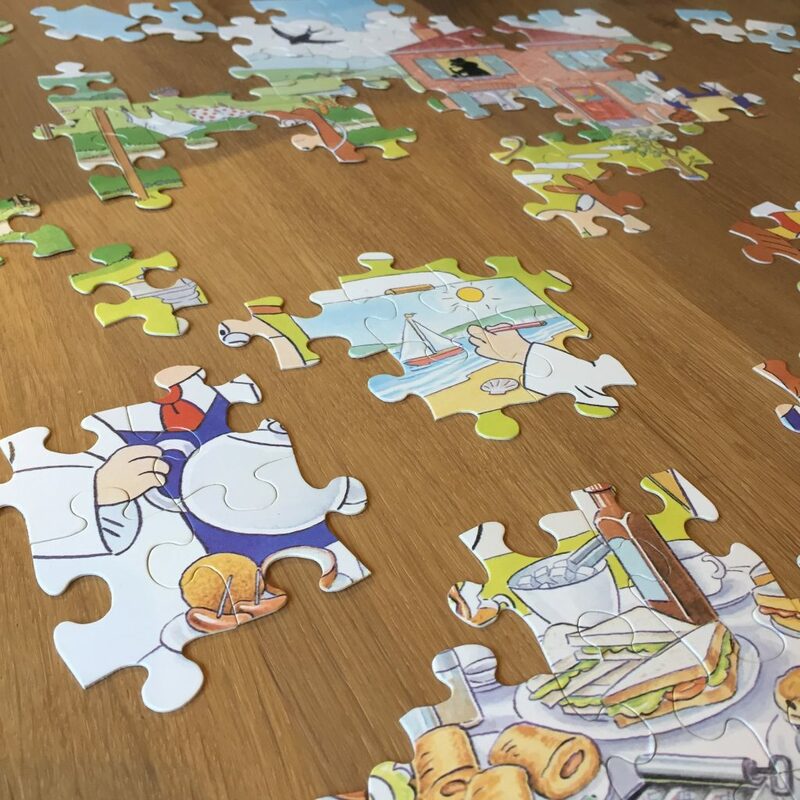 From a bit of internet research I think this jigsaw came out in about 1989, and customers had a choice of two different jigsaws. One was shaped like a tea pot and features a cut away of the inside of the Tea Folk’s house with them all going about various tasks. 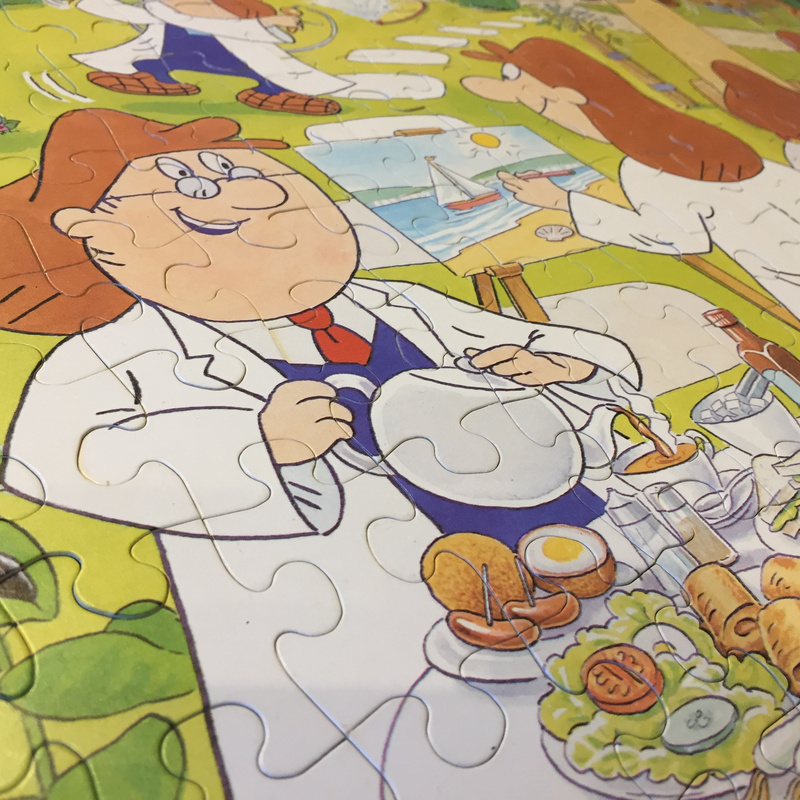 The second jigsaw is cup and saucer shaped , and this time the Tea Folk are outside in the garden. The Gaffer is making everyone a cup of tea, whilst others are gardening, playing, or trying to get to grips (unsuccessfully!) with a skipping rope in Sydney’s case! The reverse of the jigsaws features a historical Tetley Tea scene – either a woman behind a tea counter, or two men next to a Tetley’s Teas delivery vehicle. Both these pictures are sepia in colour. 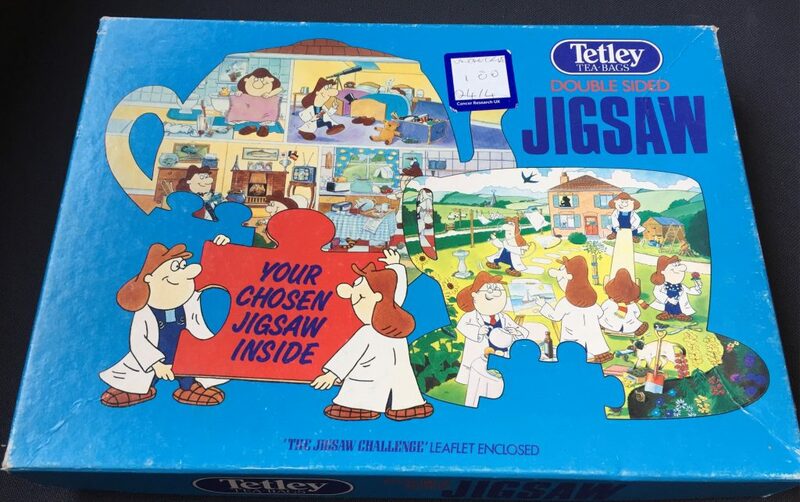 When we bought this set, we had absolutely no idea which jigsaw was inside. 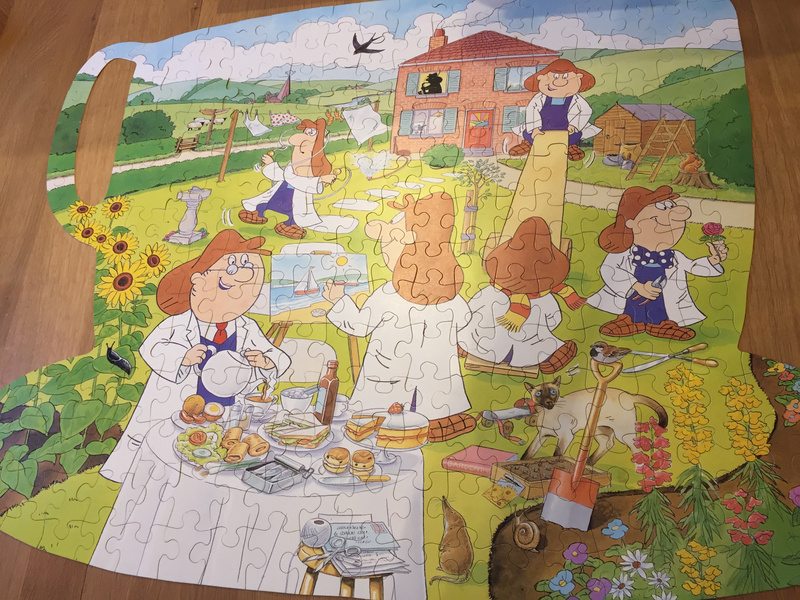 It wasn’t until I spread out the pieces and started to look at them that I figured out we had the cup and saucer shaped garden scene. The jigsaw itself is absolutely huge. Far bigger than I was expecting when I got it out of the box. And also quite tricky as it’s so large. The shape of it doesn’t help much either – with rounded edges and a cut away bit for the handle of the tea cup. This gap for the handle is done slightly strangely. There are pieces with just a white section on which can be put in place where the handle space is, but you can also take them out too. It’s lovely to see the Tetley Tea Folk back together. They first appeared in the early 1980s and hung around until 2001, when they were dramatically axed. Unsurprisingly, by 2002 Tetley’s sales had fallen as a result. After nearly ten years though they were spotted during an ad break in the middle of Coronation Street, waking up from a decade long sleep. There are a few other details in the picture that are worth note. As well as loving the Gaffer pouring out the tea for the impressive afternoon tea I am left wondering why there is only one tea cup to be seen! I also love the fact that you have a very English scene in the picture, yet rather than a traditional English village church spire or steeple you instead have a very modern triangular erection. With a tea pot on top! Ever since he realised that there was a second game on the back of the Snakes and Ladders board, Master C has become slightly obsessed with Ludo. It’s one of those games that I remember playing as a child as part of a compendium of games, but yet I don’t think I’ve touched it since childhood. I do vaguely remember that Ludo is actually based on the Indian game Pachisi. Described by some as the “national game of India”, Pachisi is a cross and circle game (otherwise known as a race game) in which players move around the board, in a race against each other. First played in medieval India, the number of spaces moved was determined by throwing six or seven cowrie shells and whether the shells landed with the opening upwards or not gave you a score. We’ve obviously moved on since then, and Ludo is played with a single die now and up to four players. Each player has four counters and each has a corner of the board as their initial home position. If a player rolls a six then they move one of their counters into their starting position, and from there a second roll of the die determines how many spaces they need to move. Players then race around the cross shape on the board, until they get back to almost where they started. Then they have to head up their coloured strait towards “home” in the centre of the board. The aim is to get all four of their coloured counters home. But it’s not as easy as it may initially seem! With players having all four counters, and different starting times for them, it ends up with everyones counters overlapping on the board. Even more so if you have three or four players. If you land on a square that already has a player’s counter on it then you knock them off the board and they have to go back to their home position, and await a six to start again. It’s also possible to block other players by getting two of your counters on adjacent squares. If you manage this then it means that other plays can not knock you off, but also can’t get past you. The only place on the board where you are really safe is on your home strait, as then no one else can catch you. As I mentioned when I wrote about Snakes and Ladders, Ludo is a much more complicated game, as you an play it with a huge amount of strategy. It’s up to you which counters you move when and whether you aim to knock the opposition off the board or not with certain moves. Realistically, it’s a huge step up from Snakes and Ladders, but at the same time it’s a perfect game for introducing strategy to children. Master C got so excited the first time that he managed to knock me off the board. He also takes a great thrill from being able to block other players by getting two of his counters together. He may not yet understand all the strategy behind why you might do either of these things, but it’s a brilliant way to get him starting to think about them. It’s also helped his mental maths come on even faster. As well as counting out each move of his own, he’s also been working out what he needs to roll to knock other players off the board. 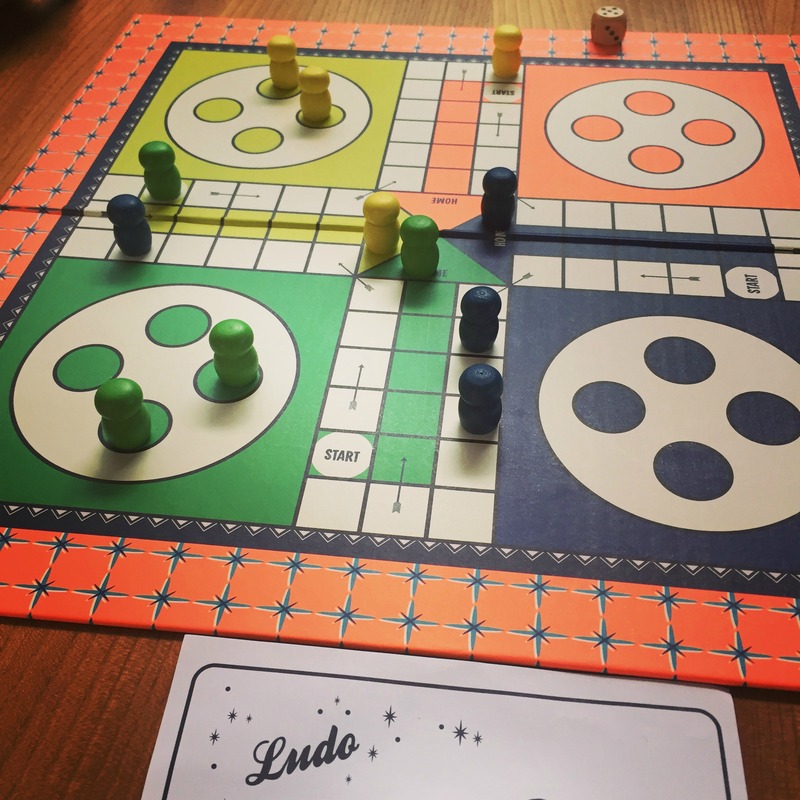 I admit that I hadn’t really thought much about Ludo being played elsewhere until I innocently put a picture of the board up on my Facebook page and a Dutch friend commented. He pointed out that Ludo looked much like a game in The Netherlands called “mens erger je niet”, which roughly translates as “Man, don’t get annoyed”. Intrigued I went off to do a bit of research and it seems that in German Ludo is called “Man, don’t get upset”. Ludo also has similar names in Albanian, Bulgarian, Croatian, Czech, Macedonian, Russian, Serbian, Slovak, Slovene, and Turkish. In Greece there is also a reference to players behaviour in the fact that they call it “Grumbler” and Italian just call it “Don’t get upset”. I had no idea that what I had just thought of as a simple game could bring about such a response from players! And I Guess it just puzzles me even more as to why it so often seems to be found on the reverse of a game as innocent as Snakes and Ladders! 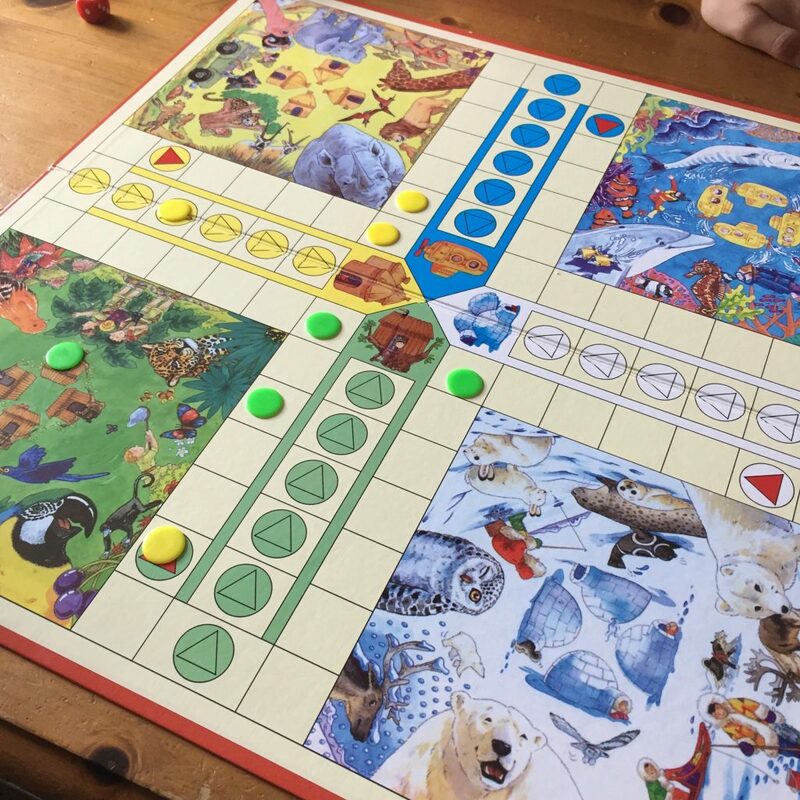 A variety of different Ludo sets (with and without Snakes and Ladders) are available to buy online here. For a while now Bonn and I have been collecting various vintage board games. We’ve been picking them up from charity shops all over the place with the aim of featuring as many as we can here on Penny Plays. The idea is that we can feature each of the games and maybe include some in videos and podcasts that we have planned. I guess that means it’s time to welcome our first vintage game here on Penny Plays – Rack-O. Last Monday saw us luck enough to stumble across a car boot sale as we headed home from the ferry port. We managed to pick up quite a lot whilst we were there. 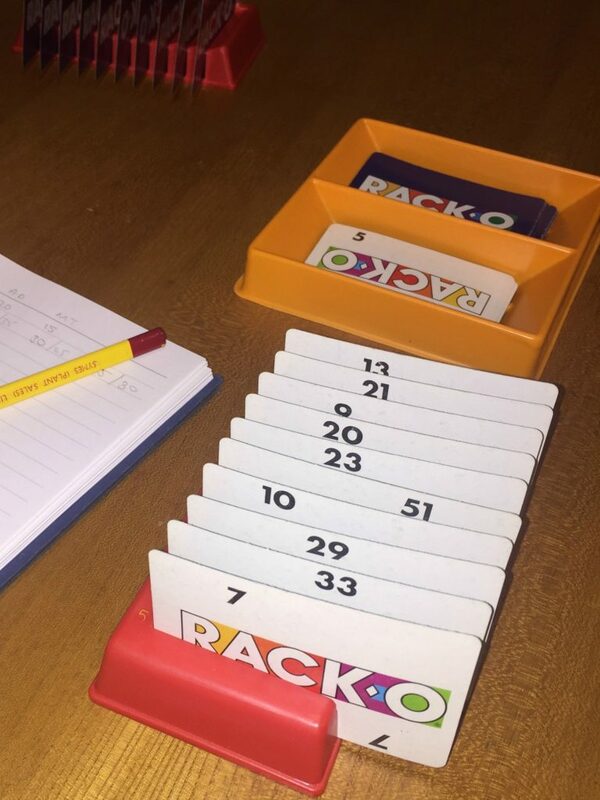 One such game being Rack-O. For the grand price of 66p! Now I have to admit that I’d never heard of Rack-O before last week. The box told us that it was a card game that involved putting things in order, but not much more than that. As general card game fans we were very much up for giving it a go though. Aimed at ages 8 to adult we played with my Mum and step-daughter. The aim of Rack-O is to get your cards in numerical order. Much like you might do in the regular card game of Rummy, or “Threes and Fours” as I always knew it. 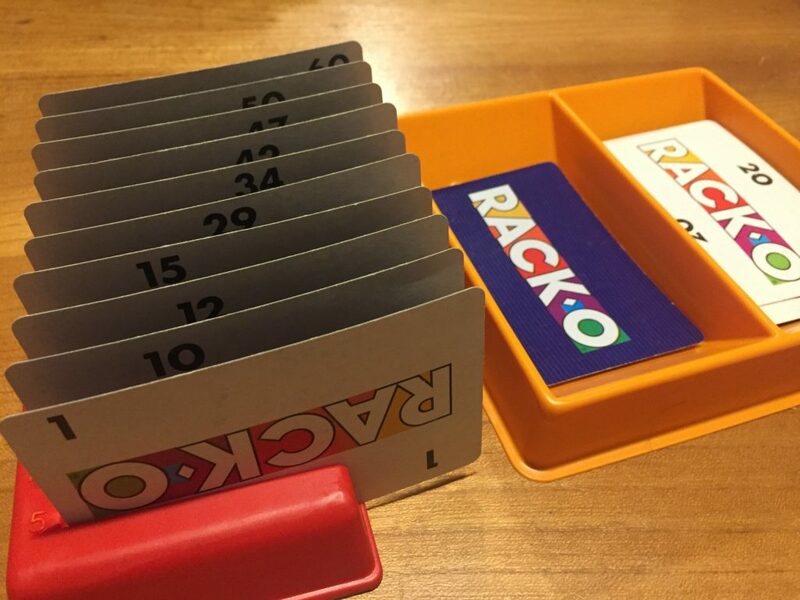 Rack-O isn’t played with regular cards though. Instead you have cards numbered 1 to 60. In the regular four player game, which we played, each player is dealt ten cards and has to place each card in his or her Rack-O rack immediately. In the order that they are dealt. Each space in the rack has a number next to it and these go in fives from 5 up to 50. The first card dealt goes in the 50 slot and the final one in the 5 slot, with others following in-between. At this stage I literally found myself having to sit on my hands as not being able to put the cards in numerical order was very hard to bear! It’s something that you so naturally do in card games, but not in this one. The remaining cards are placed in the centre of play in a pile. This is the stockpile. The top card is turned over next to them and forms the first card in the discard pile. Game play goes around the table clockwise from the dealer and the aim is to get your cards in numerical order from front to back in your rack. When you do this you then shout “Rack-O” and win that game. The way you get the cards in order is that you need to take cards from the table and replace cards already in your rack with them. Each turn you can either take the card on top of the discard pile or one from the stockpile. If you want to keep a card you put it in your rack, in whichever position you choose. The card you have replaced is then put on the discard pile. You don’t have to have straight runs of numbers (at least not in the regular four player game), but they just need to go from lowest to highest. What makes the game particularly interesting is the scoring. And for this you definitely do need paper and pencil whilst you play. The overall winner is the first player to get to 500 points. The person who shouts Rack-O first in a game gets a total of 75 points. 25 of these are for shouting Rack-O whilst the other 50 are for the cards in his rack. 5 points for each of the ten cards in the rack. Other players score 5 points for each card in their rack in low to high order, starting with the card in the number 5 slot. This counting of points stops when you get to a card that is out of order. Also, the last four cards in the rack do not count. This means that whilst the winner of the game gets 75 points, the maximum anyone else can score is 30. We tried out the standard 4 player game, but variants are available for 2 or 3 players. In these you use less cards and the two player version also requires your to have at least three cards in immediate sequence in the rack to call Rack-O. It is also possible to play as partners when playing with four players. 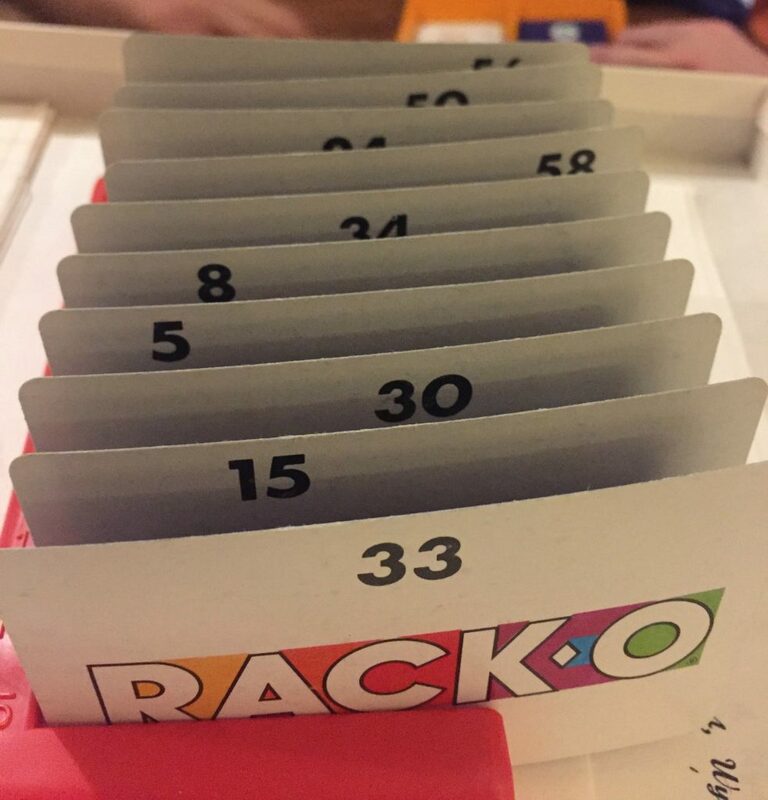 There is also Bonus Rack-O in which you get extra points for runs of numbers when you shout Rack-O. Get a six or more card run and you can end up with a massive 475 points when you shout Rack-O. 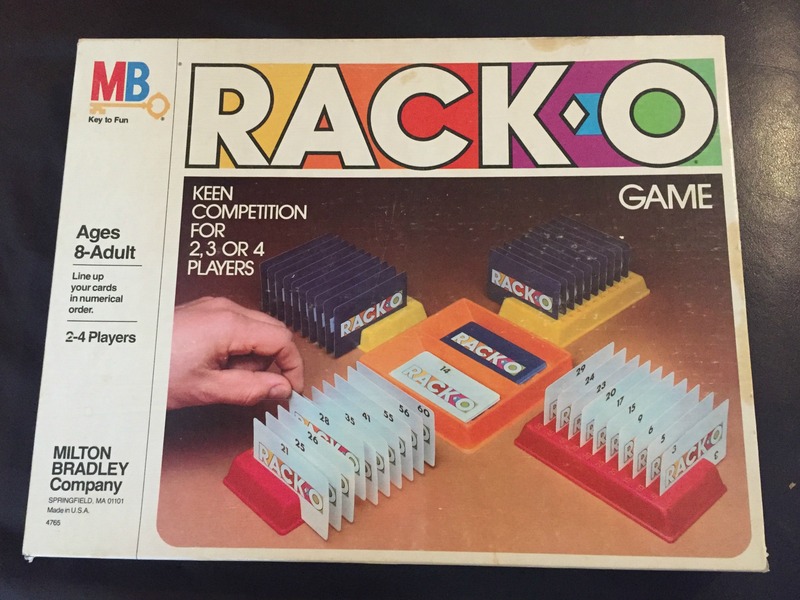 A bit of a search online suggests that Rack-O was first brought out in 1956 by Milton Bradley – more commonly known as MB. The version we found is probably early 80s as it says copyright 1980 on the box, but 1978 on the instructions. In later years the game was produced by Winning Moves. It seems that Rack-O wasn’t actually all that obscure. A quick look on Instagram with the #racko hashtag, also suggests lots of people are still playing it. All around the world. There are also lots of old versions of it still for sale online. Whilst we all had a great time playing Rack-O there were a couple of nice touches that are really worth shouting about. Firstly the racks and tray for the stockpile and discard piles. It’s lovely to see both made from a sturdy plastic that shows no signs or raging or wear after all these years. Secondly, and most importantly in my eyes, the card design. In particular the positioning of the number on the cards.These go across the top edge, but are done so that they are in a different position for each number, with lower numbers at the left and higher ones at the right. This means that as you look down your rack you can easily see any card that is out of position. A small thing that makes game play so much easier. When we buy games at car boots and charity shops we always do so with the idea that we’ll try them out and then either sell the on or donate them to a charity shop if we don’t like them. The measure how a good game is if we decide to keep it. Rack-O is definitely in the keep pile! 66p very well spent.